June 16, 2001 found approximately eleven club members on the Eastern side of the Sierras. We had traveled long and hard to get there and they was not going to be any denial by the fish. When we arrived the conditions were extremely difficult. The water was low and fish were a little of because of it. We spread out over approximately three miles. In this area we found pocket water, slow moving clear streams, meadows and very little fast rapids. These conditions were more like you�d expect in September. Never-the-less, the enthusiasm was electricfying. The club members attacked the stream and found some trout were willing to accept our offerings. It proved to be another great time. Connie and Homer were among the members like Judy and Alan that managed to take fish. 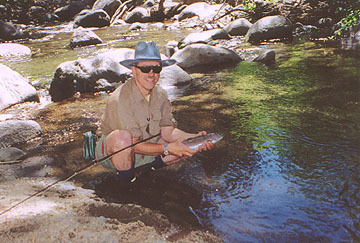 The stream proved to be less productive than a small lake that Dave Black and Richard Holubek found the day before. This lake which they called "Fishbowl Lake" was very productive for anyone willing to launch their float tube. 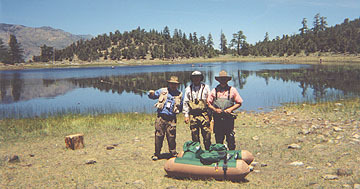 They reported catching great trout nearly every cast. It was soo good that Dave Harris and Dennis Marquette gave it try and came away with a great experience. This high Sierra lake was a real find. 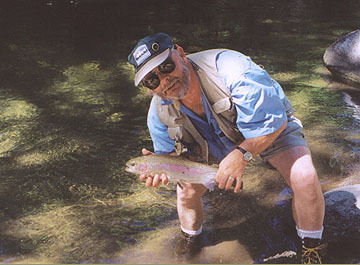 Richard Holubek tried another lake and caught two lake salmon.